My new book, Preparing for the Certified OpenStack Administrator Exam , will be out in July 2017 on Packt Publishing. The exam prepares students for the upcoming Newton version of the exam on Ubuntu 16.04. The exam currently tests on Liberty but will be upgraded to Newton in May 2017. Ask anyone about getting started in the IT world and they may suggest looking into industry-recognized technical certifications. IT certifications measure competency in a number of areas and are a great way to open doors to opportunities. While they certainly should not be the only determining factor in the hiring process, achieving them can be a measure of your competence and commitment to facing challenges. Upon completion of a passing grade, you will receive your certificate. Laminate, frame, or pin it to your home office wall or work cubicle! It’s proof that you have met all the requirements to become an official OpenStack Administrator. The certification is valid for three years from the pass date so don't forget to renew! 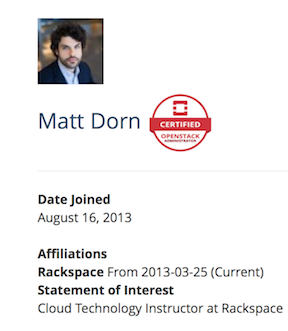 In addition to the certification, a COA badge will appear next to your name in the OpenStack Foundation Member Directory. The OpenStack Foundation has put together a great tool for helping employers verify the validity of COA certifications. Check out the Certified OpenStack Administrator Verification Tool. 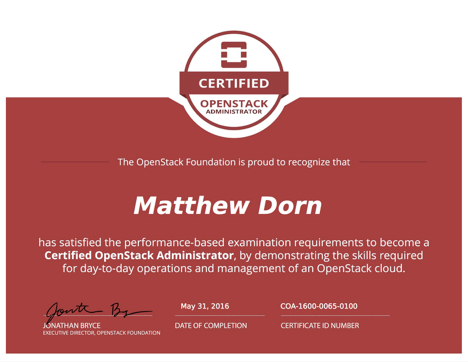 7 Steps to Becoming a Certified OpenStack Administrator! Let's begin by walking through some steps to become a Certified OpenStack Administrator! Practice. Practice. Practice. Use this book and the included OpenStack All-in-One Virtual Appliance as a resource as you begin your Certified OpenStack Administrator journey. If you still find yourself struggling with the concepts and objectives in this book, you can always refer to the Official OpenStack Documentation or even seek out a live training class at the OpenStack Training Marketplace. Once you feel that you’re ready to conquer the exam, head to the Official Certified OpenStack Administrator Homepage and click on Get Started. After signing in, you will be directed to checkout to purchase your exam. The OpenStack Foundation accepts all major credit cards and as of April 2017, costs $300.00 USD but is subject to change so keep an eye out on the website. You can also get a FREE retake within 12 months of the original exam purchase date if you do not pass on the first attempt. To encourage academia students to get their feet wet with OpenStack technologies, the OpenStack Foundation is offering the exam for $150.00 (50% off the retail price) with a valid student ID. Check out https://www.openstack.org/coa/student/ for more info. Once your order is processed, you will receive an email with access to the COA Portal. Think of the portal as your personal COA website where you can download your exam receipt and keep track of your certification efforts. Once you take the exam, you can come back to the COA Portal to check your exam status, exam score, and even download certificates and badges for displaying on business cards or websites! You must be at least 18 years old and have proper identification to take the exam! I personally recommend scheduling your exam a few months ahead of time to give yourself a realistic goal. Click on the Schedule Exam link on the COA Portal to be directed and automatically logged into the Exam Proctor Partner website. Once logged into the site, type OpenStack Foundation in the search box and select the COA exam. You will then choose from available dates and times. The latest possible exam date you can schedule will be 30 days out from the current date. Once you have scheduled it, you can cancel or reschedule up to 24 hours before the start time of the exam. Step 7 - Take the Exam! Your day has arrived! You've used this book and have practiced day and night to master all of the covered objectives! It's finally time to take the exam! One of the most important factors determining your success on the exam is the location. You cannot be in a crowded place! This means no coffee shops, work desks, or football games! The testing location policy is very strict, so please consider taking the exam from home or perhaps a private room in the office. Log into the COA Portal fifteen minutes before your scheduled exam time. You should now see a Take Exam link which will connect to the Exam Proctor Partner website so you can connect to the testing environment. Once in the exam environment, an Exam Proctor chat window will appear and assist you with starting your exam. You must allow sharing of your entire operating system screen (this includes all applications), webcam, and microphone. t’s time to begin! You have two and a half hours to complete all exam objectives. You're almost on your way to becoming a Certified OpenStack Administrator! 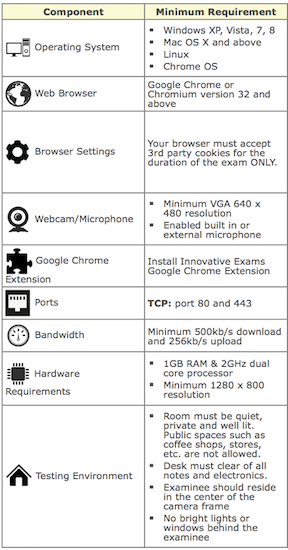 The exam console is embedded into the browser. It is composed of two primary parts: The Content Panel and the Dashboard/Terminal Panel. The Content Panel is the section that displays the exam timer and objectives. As per the COA Handbook, exam objectives can only be navigated linearly. You can use the next and back button to move to each objective. 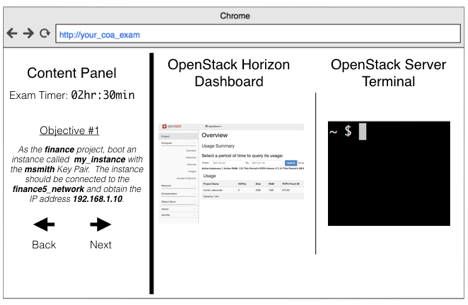 The Dashboard/Terminal Panel gives you full access to an OpenStack environment. Chapter 2 of this book will assist you with getting your practice OpenStack environment environment up and running so you can work through all the objectives. The exam console terminal is embedded in a browser and you cannot SCP (secure copy) to it from your local system. Within the terminal environment, you are permitted to install a multiplexor such as screen, tmux, or byobu if you think these will assist you but are not necessary for successful completion of all objectives. You are not permitted to browse websites, email, or notes during the exam but you are free to access the Official OpenStack Documentation. This can be a major waste of time on the exam and shouldn’t be necessary after working through the exam objectives in this book. You can also easily copy and paste from the objective window into the Horizon dashboard or terminal. If you struggle with a question, move on! Hit the next button and try the next objective. You can always come back and tackle it before time is up. The exam is scored automatically within 24 hours and you should receive the results via email within 72 hours after exam completion. At this time, the results will be made available on the COA Portal. Please review the Professional Code of Conduct on the OpenStack Foundation Certification Handbook. Let's now take a look at the objectives you will be responsible for performing on the exam. As of March 2017, these are all the exam objectives published on the Official COA website. These objectives will test your competence and proficiency in the domains listed below. These domains cover multiple core OpenStack services as well as general OpenStack troubleshooting. Together, all of these domains make up 100% of the exam. Because some of the objectives on the official COA Requirements list overlap, this book utilizes its own convenient strategy to ensure you can fulfill all objectives within all content areas.